NEW ORLEANS – Don’t look now, but there is less than one month remaining until the 2018 NCAA Division III Outdoor Track & Field Championships. 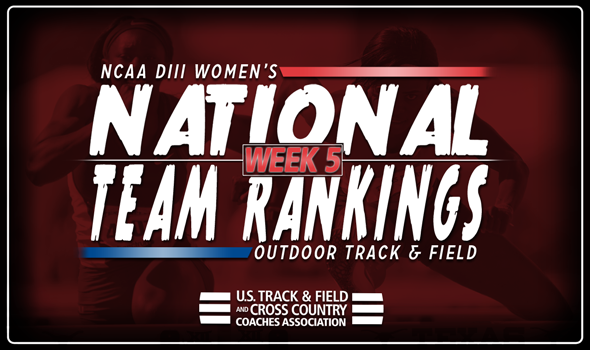 The most recent National Team Rankings, released Tuesday by the U.S. Track & Field and Cross Country Coaches Association (USTFCCCA), reveal that it’s still anybody’s guess as to which team is going to win the women’s team title, but Claremont-Mudd-Scripps has a leg up on the rest. A strong effort this past weekend vaulted the Athenas to the front of the pack over former No. 1 George Fox. Claremont-Mudd-Scripps recorded top-10 marks nationally in the 100, 200, 100 hurdles and 4×100 relay. Tyra Abraham was the biggest factor for the Athenas as she clocked a wind-aided time of 11.59 in the 100 to take over the top spot nationally in that event and move up to third on the NCAA DIII all-time chart. Abraham also served as anchor leg on Claremont-Mudd-Scripps’ 4×100 relay team that is ranked first nationally. UMass Boston settled right behind third-ranked Williams at No. 4. The Beacons added a sixth top-5 mark nationally this past weekend as their 4×400 relay team got the baton around in 3:50.95 with Wadeline Jonathas on the anchor leg. Oberlin comes in at No. 6, up two spots from Week 4. The Yeowomen watched Monique Newton record the fifth best mark this season in the hammer (53.90m/176-10) to help them continue to rise in the rankings. Washington (Mo.) is ranked seventh, up five spots from last week. The Bears had a handful of strong efforts this past weekend, including a national top-5 mark from Alison Lindsay in the steeplechase (No. 4, 10:42.71) and a top-10 listing from Julia Dannenbaum in the pole vault. Settling right outside the top-10 is Ithaca at No. 11. The Bombers soared seven spots between Week 4 and Week 5 after Taryn Cordani and Katherine Pitman turned in all-time efforts. Pitman improved her NCAA DIII record in the pole vault to 4.31m (14-1¾), while Cordani is third all-time in the 10000 at 33:44.06. There will be three more sets of rankings between now and May 24-26 when the 2018 NCAA Division III Outdoor Track & Field Championships get underway in La Crosse, Wisconsin.